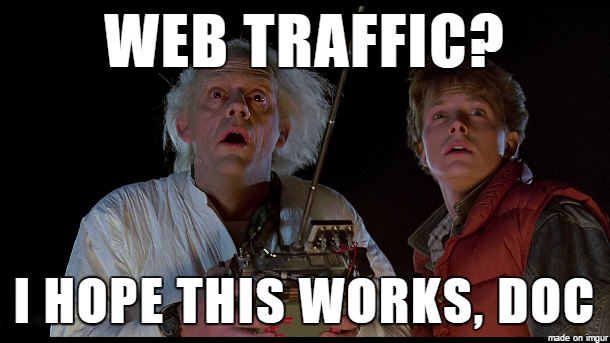 Web Marketing Experiment: How Long Does it Take to Get Web Traffic? When Starting a Website / Blog from Scratch, How Long Does it Take to Get Web Traffic? This is possibly one of the most often wondered questions of people venturing into the World of promoting themselves online. Whilst we often see results when we search for things in Google that are marked “4 hours ago” and such like, these are usually links to new pages on websites which already have huge reputation with Google, news outlets, for example. I am curious as to how long it can take a new, relaunched website to gain exposure and show up atop Google Search Engine Results Pages (SERPs). So, this new website of mine is to be an experiment to see just how long this process can take. I must point out however, that the domain this site is hosted on has been mine since 2009 and had relatively good position within Google for the terms I was aiming for, so that may have an impact. Although, I am now going to be aiming for some completely new keyphrases, so that will be the “new” element. The methods I’ll be using alongside basic SEO will be standard web marketing stuff, like social media and email marketing, oh and WordPress plugins. I will keep you updated with my findings. If you’re reading this around the time of publishing, you’ll see I am starting with little content (three pages and three blog posts). Rather than build a “completed” website, I am going live with the bare minimum and building from there, in an agile fashion. Have you launched a website from nothing and got great results? What advice would you share with others on achieving this? Let me know in the comments section. New Website Launched!Phil, Where is Your Portfolio and Testimonials?